I covered the big tobacco bill that John McCain carried in the U.S. Senate back in 1998. Does anyone even remember that one? At any rate, I saw for myself all the qualities that have become cliches in describing McCain ever since. A charmer of the press. Quick witted. Capable of losing his temper in a hurry, etc. I offer this confession in case anyone wants to question this assertion based on my typical McCain media bias: I can't remember ever seeing a political comeback like McCain's this year. Which is part of why his comeback is so remarkable. No one loves you when you're down and out, but Republican voters didn't seem to really love McCain even when he was on top. Remember when he was the pre-Giuliani, pre-Fred Thompson frontrunner? That was all based on name recognition, plus some grudging acceptance of the fact that McCain is his party's best chance for holding onto the White House. 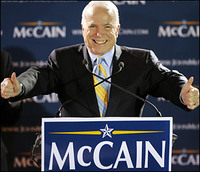 Once McCain slipped from the top spot, there was no love lost for him at all. His position on immigration seemed to doom his chances and he seemed to be not even left with his dignity, having swallowed so much pride in making nice with the likes of Jerry Falwell. Yet McCain stuck to his guns. He may yet prove to be the last man standing in what had been a crowded and topsy-turvy Republican field. And, as I said, he certainly represents his party's best hope for the White House -- a possible outcome that would obviously make his comeback that much more remarkable still.